I'm so happy to report that I am home from my marathon road trip. Overall it was good, but now that I'm home I'm feeling like I need a vacation from my vacation! I'll post pics soon. I have lots and need a good chunk of time to sort and download them. Until then, here is one picture I want to share. I usually attach it to my belt loop or my pack when I hike. The bell jingles while you walk and supposedly makes enough noise to alert a bear to your presence and cause them to flee. 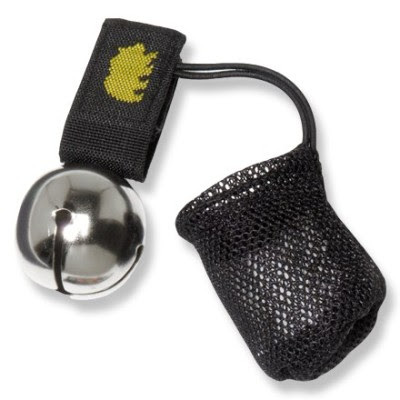 When not hiking, the bell is stored in that handy little mesh bag that has a magnet at the end to keep the bell silent. Of course hiking with kids who make a lot of noise might have the same effect. Kids are a little harder to silence though. I have a healthy respect for bears and definitely feel a little more secure hiking with my bell. And I guess it works since I've never seen a bear while hiking. I did see a bear last week though. Actually, I saw two bears. A mama and her cub. We were riding a train from Durango to Silverton (more about that when I post pics) and my sister-in-law glanced up at a grassy hillside and saw the bears sitting on a large rock. She pointed for all of us to see and right after she pointed, the mama bear turned to the cub and they both took off running uphill. It all happened so quickly that none of us got a picture. Argh! It was so great though! That brings my bear count up to four, all of which I've seen from the safety of a car, a train, or a cabin! Just the way I prefer it. I threw my bell in my suitcase when I was packing because the owner of the cabin we rented for the week emailed us to say that he had seen a bear while hiking a few weeks prior to our arrival. I thought it would be a good idea to wear it if we went on a hike. You know what? We didn't hike. In fact, this afternoon while I was unpacking I picked that bear bell up and realized that I haven't hiked one single time this entire summer. If you've read this blog for any length of time you know I LOVE to hike. In fact, I can't even remember the last time I went. That makes me more sad than you can know. It's definitely something I need to remedy. Soon. Probably when school starts and I have more time to myself than I know what to do with. I'm sad for you. Because I know how happy hiking makes you. And you need some happy this summer. So exciting that you saw the bears!!! This made me laugh because I SO need a bear bell. Patrick and I saw a bear once while hiking in AR and I refused to go a step farther and then we faught the whole drive home. Ah, memories. Do you think the bell would scare away snakes too? i haven't hiked in ages but i'm blaming mine on a horrible pregnancy then a baby. i'll hike again though. maybe this fall with her in the ergo. That is wicked cool that your bear bell has a magnet and mesh bag. Mine only has the noise. We were too distant (car) to get a picture, too, but it sure was exhilarating. Yeah, the kind of hiking you're doing now, is more trudging...I'll pray that you get out there and at least enjoy a bit of the mtns ASAP, even if you're not on Pike's Peak. I'll just live vicariously through you, Mer, because the thought of encountering nature, uh, out in nature, is just a bit much for me. I'll just watch Man vs. Wild and be done with it. PS - Glad you're back in the blogosphere - I was SAD without you. Sad that you weren't able to get some hiking in too, Mer. I have some OBU friends who have recently relocated to Denver and LOVE hiking but are brand new to CO. Hoping to get you connected before too long. So glad you're back! But, very sad that you haven't had any hiking time b/c I DO know how much you love it!! Here's to recuperating from vaca and lots of hiking to come! What a handle little bell. 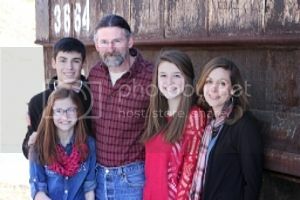 :) Being in TN I've seen probably half a dozen black bears and a couple grizzlies while at Yellowstone Nat'l Park, but to live where I have to wear a bell ... hmmm, not sure about that! A bear bell? Who ever heard?! That's clever. Go hiking, Mer. That's an order! We live in Colorado Springs and I also have hiking withdrawal if too long goes by without enjoying the mountains. It renews me and is one of those things that God uses to breath life into me. Me and the book club I go to are doing the Incline soon, which is a really steep old railroad hike (goes up Pikes Peak) so I have started to get ready for that challenge. Not sure if my 41 year old body is up to the steep grade anymore, but will give it a try. I hope you get a chance to go hiking soon and can totally relate to your love for hiking! I love hiking too, and have seen bears, and I used to have a bear bell, but it bit the dust. I need to get a new one. I worry more about mtn lions! Besides hiking with a dog, what else can you do for scaring off mountain lions when you hike? Welcome home! I've been waiting for you to get back (and I even gave you a few days to do laundry and soak up the home-ness). But might you want to hike with a blogging friend? We're coming in August.